We love the Veggie Tales at our house. My five year old and my two year old do not always agree on what to watch, but whenever I pull out a Veggie Tales DVD, they are both satisfied. So when Family Review Network sent us a new Veggie Tales movie to review, I knew my boys would be excited and eager to be of service for this task, hehe. This latest Veggie Tale adventure is set like an Indiana Jones theme...which was perfect for my five year old, especially. It is full of adventure (not wild and dangerous stuff like Indiana Jones, of course,) that had my son acting out the scenes the second and third time he watched it. Minnesota Cuke (aka Larry the Cucumber) is a museum curator who sets out on a search for Noah’s Ark. During his search, he finds out about an umbrella that is very powerful. But a not-so-nice-guy is also is trying to take the umbrella for himself. Poor Minnesota Cuke is having self-confidence issues, that hinder his search for the umbrella. He is especially worried about what others will think of him. 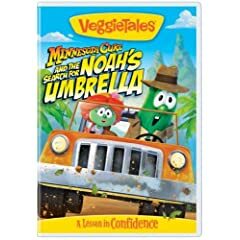 It all about self-confidence in this Veggie Tales DVD, and I love that, especially since my five year old is entering Kindergarten now and could certainly use a more confidence. I love the gentle lessons and the humor that is in all the Veggie Tales Movies, and this latest is no exception. And what would a Veggie Tales Adventure be without a new song? We were very entertained with the catchy “Silly Songs with Larry” tune called “Sippy Cup”. Great DVD for you and the kids to enjoy together...if you are not a Veggie Tales fan yet, this latest movie is sure to make you one! Minnesota Cuke and the Search for Noah's Umbrella retails for $14.99. You can purchase the DVD directly from the Big Idea website, or in stores near you. This post was written for Family Review Network as part of a program for Big Idea, who supplied the DVD for review.